i've been about here for a while, but don't post too often so i had better re-introduce myself. my name is colin. mechanical engineer during the day, car racer/make stuff/get into trouble the rest of the time. i bought an industrial hobbies mill and cnc conversion from aaron a few years back. since i have a bridgeport also i took my time putting it together... how long ago did he sell the biz?... that's time taking. recently i decided i had better finish it, or sell it.... so finish it i will. i built the enclosure out of wood and laminated it with fiberglass and white gel coat. was going to do a sheetmetal enclosure, but hear tales of big noise and vibration. 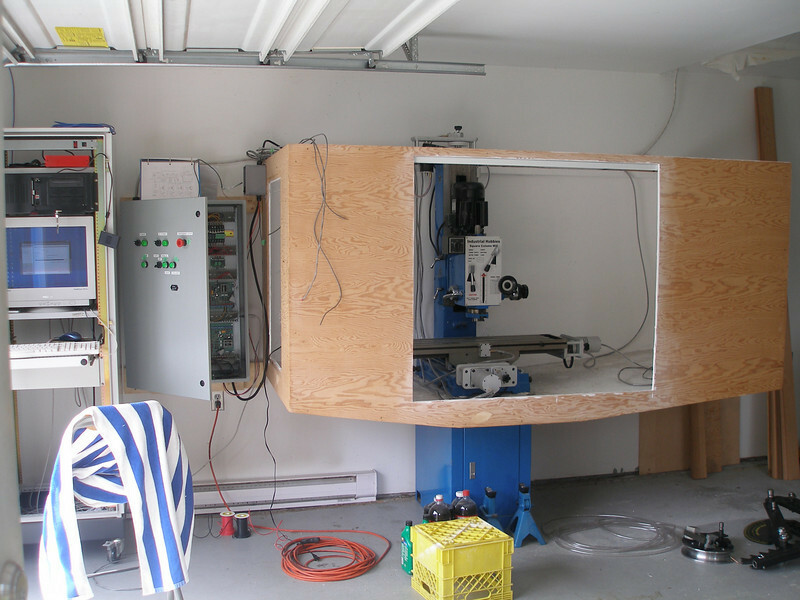 the doors are not hung yet, but they are wood also with plexi windows so i can see my machine crash. 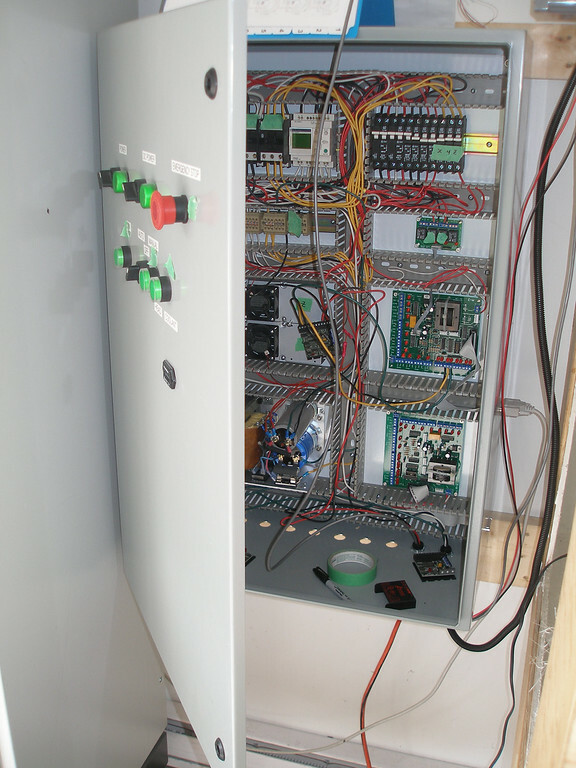 the control panel has 2 campbel breakout boards and relay panel as well as the gekos and a little plc i'm using to control all the odds and ends. it's a work in progress so i apologize for the messy wiring. i'll get it all sorted out pdq. if you see anything that seems fishy please point it out. i'm doing my best to not blow things up, but i'm pretty sure some magic smoke will get out. 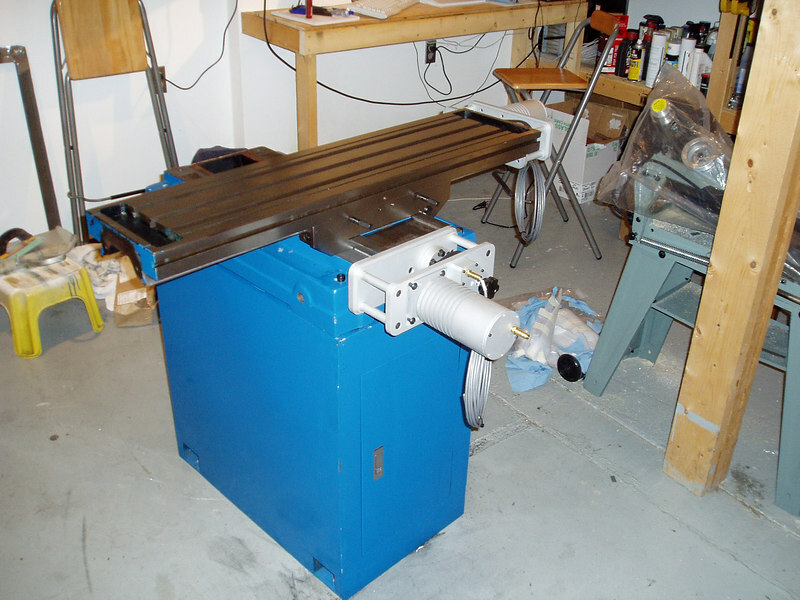 Any one ever built a milling machine for cutting mild steel? Any builds on here? Last edited by Loadedagain; 08-26-2009 at 08:28 PM. dad used to say... "once is ignorance. the second time you're stupid!" nice work. i've often contemplated building an encloser like to house my IH mill but haven't gotten around to it yet. so far i use mist coolant and sweep the floor. for the really have heavy stuff i use my fadal 3016. Wow that looks AWSOME! Details details! ballscrews yet? How big are those XYZ motors? Servo or steper? Im guessing servo at that size. 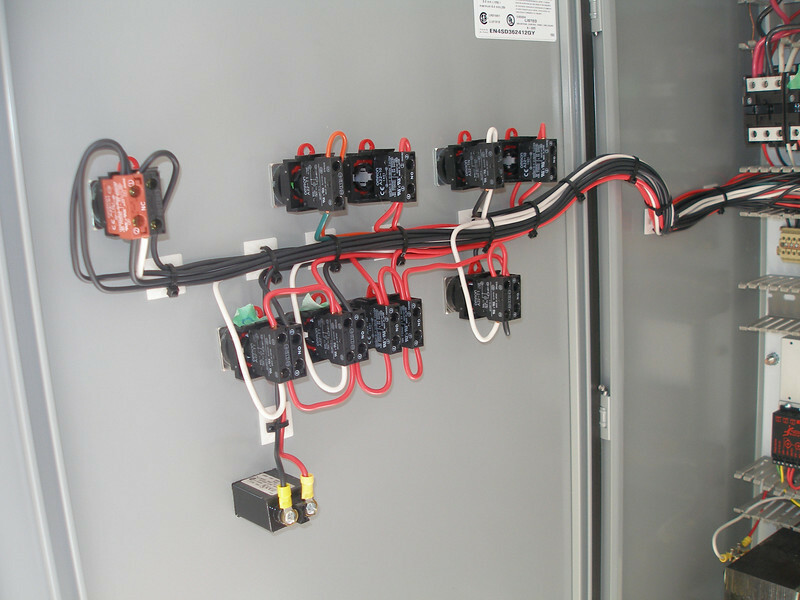 *drools* you did an amazeing job on the electrical box! Maybe a couple of zip ties to group wires later on. the servos are supplied by aaron and as he said "are big enough to seriously break sh*t!". not sure of their exact sizes. that seemed good enough for me ;-] ballscrews are rockford paieces. as for the wiring i've got a few hours of zap strapping ahead of me. believe it or not most of it checks out. only melted a couple dozen wires.... that's pretty good for me. door is zap strapped. the rest will be done later this week hopefully. But yea those servos are awsome. some (smaller) mills have smaller motors driving the spindle lol. That's going to be nice. I'll bet the wood will absorb some of the noise too. I am a professional cabinet builder so a beauty wood enclosure would be a piece of cake for me. However I was seriously concerned about the moisture problems. What was your process for the fiberglass application? Were you able to spray the eclosure with the gelcoat or is this brushed on. Forgive my ignorance but I have not done much fiberglass work. The outside could be coated with a nice poly thick coat and to match the machine if wanted but the inside would need to be sealed up pretty good. I know that the wood would certainly quell vibration and noise and some nice plexi windows in the right place would be great. Yours is looking real nice. 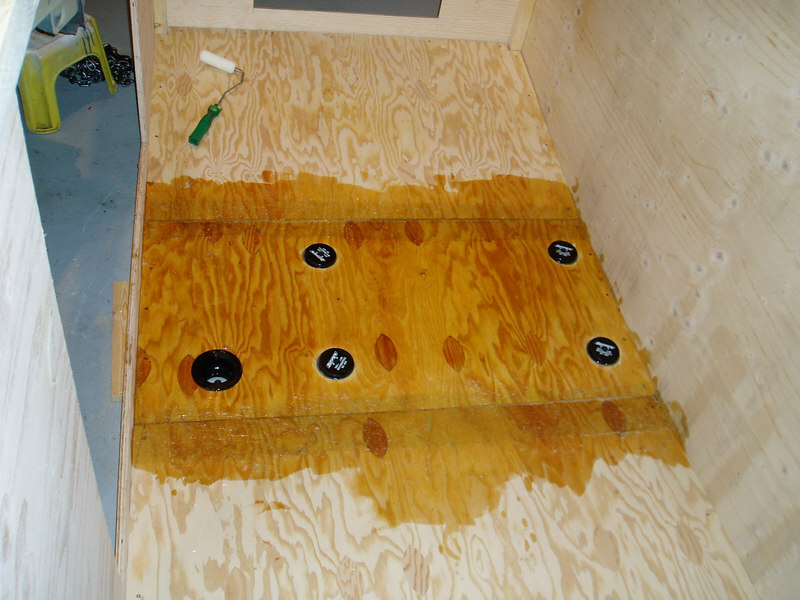 Let's assume you build a nice tight enclosure out of some cabinet grade plywood, carefully glue and caulk the seams and then spray on some kind of heavy thick finish that is to be the seal. What would be a good product to use for this and short of fiberglassing the entire inside of the box? Of course fiberglass would only really need to be on the bottom foot or so to make it watertight. This idea is really appealing to me right now as I very much wanted to go flood coolant and build an all encompassing enclosure. I know some fellows with the tormach machines added to their enclosures with wood and some kind of coating but I cannot find a post right now. Any ideas or inspiration would be much appreciated... again nice job!!! i built the enclosure out of 1.5 x 1.5 square, then screwed 1/2" ply to the outside. for waterproofing i first sprayed a coat of polyester resin, then one layer of matting with polyester resin. to colour it i sprayed the white gel coat. to mount windows i used a routed to "machine" 1/2" grooves. i'm going to stick plexi window in with silicone, then caulk the inside... i think it'll be pretty sealed. time will tell i suppose.